The International Meeting, often known, simply, as ‘The International’, is a two-day fixture held on a Friday and Saturday in the middle of December at Cheltenham Racecourse in Gloucestershire in South West England. The fixture takes its name from the feature race, the International Hurdle, currently sponsored by online gambling operator, Unibet, which takes place on the second day, although the whole weekend has a more ‘international’ feel to it than you might otherwise expect to find in the Cotswolds. The highlight of the opening day, for example, is the Glenfarclas Country Handicap Steeple Chase, which concludes a series of ten similar races – including the oldest and most difficult of them all, the Velka Pardubika in the Czech Republic – that constitute the Crystal Cup European Cross Country Challenge. Run over 3 miles 6 furlongs on a twisting, turning course of banks, ditches, hedges and rails, the Glenfarclas Country Handicap Steeple Chase is the ideal finale of series designed to find the finest horses and horsemen in the specialist discipline of cross country. On the second day, the International Hurdle is a Grade 2 contest run over 2 miles and 79 yards, and eight conventional flights of hurdles, on the New Course at Prestbury Park and open to horses aged four years and upwards. The race is, nonetheless, a recognised trial for the Champion Hurdle at the Cheltenham Festival and was, in fact, inaugurated as the Cheltenham Trial Hurdle in 1963. The last horse to win both races in the same season was Rooster Booster in 2002/03, but My Tent Or Yours, the winner in 2017, had previously finished runner-up in the Champion Hurdle in 2014, 2016 and 2017. Reigning Champion Jockey Richard Johnson, who rode Rooster Booster, is the most successful jockey in the history of the International Hurdle with six wins. 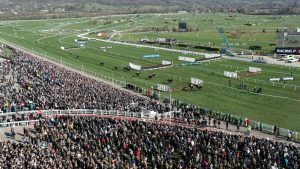 The supporting card for the International Hurdle also includes the Caspian Caviar Gold Cup, a Grade 3 handicap steeplechase run over 2 miles and 5 furlongs on the New Course and inaugurated in the same year as the International Hurdle, as the Massey Ferguson Gold Cup. The race is open to horses aged four years and upwards and is often contested by horses that ran in the Betvictor Gold Cup at the previous November Meeting at Cheltenham.